Sixty-two readers love this post. Brooklyn, Brooklyn, Brooklyn. Everyone is talking about how Brooklyn is the new hot spot. Now to be honest with you, I’m an Upper East Side girl. I’ve lived here for years. It’s my neighborhood. I love it. Although I will have to say that Brooklyn has gotten some fantastic distillers and producers of incredible liqueurs over the past few years who are coming up with some amazing libations. I have gotten to know some of the owners and producers of these wonderful products and I decided to create a cocktail dedicated to a few of these great guys and their flair for flavor. So let me tell you about “The Boys of Brooklyn” and their creative and sensational spirits. First up is Ragtime Rye from Allen Katz of New York Distilling Company. Ragtime Rye is a straight American rye aged a minimum of 3 years in full size new charred oak barrels. The Rye is grown in Upstate New York specifically for New York Distilling Company. Spicy, peppery and a smooth oak finish; highly enjoyable. Allen is a super nice guy who is quite the expert in the food and beverage industry. He also happens to look like he stepped straight off the set of Mad Men! Stop by the distillery and have a cocktail at his bar The Shanty and say hello! Next up is Barrow’s Intense Ginger Liqueur from Josh Morton and his company Barrow’s Intense. There are several ginger liqueurs out at the moment. This one starts out subtle and then packs a bit of a punch! The best part about it is that it’s made from fresh ginger that’s been infused in neutral cane spirit .No flavors, no chemicals, nothing artificial. All ginger baby! Josh originally developed it in his apartment on Barrow Street although the distillery is now in Industry City in Sunset Park. They fill, label and number each bottle by hand. You have to love that. With his long hair and beard he’s just a cool, hip guy. Last but not least… Sorel Liqueur made by Jackie Summers and his company Jack From Brooklyn, which is based in Red Hook. Sorel is a modern twist on a Caribbean drink; made of hibiscus, spice and everything nice. Aromatic and oh so delicious! Jackie is a muscular guy with a smile that just lights up the room. He’s got a real inspirational story and a big positive outlook on life. 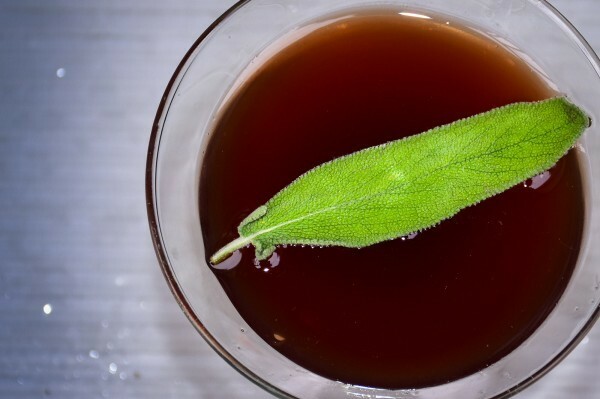 So I combined all three spirits together and garnished my cocktail with a sprig of sage. It complements the cocktail and brings out the flavors and aromas so well. So raise a glass to Allen, Josh and Jackie; three mensches. Hmm…. maybe that can be the name of my next cocktail! Cheers!!! !